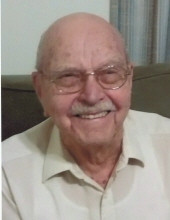 Robert Leslie Kollars, 93, of Herrin, IL, went home to be with the Lord 2:35 a.m. on Tuesday, July 10, 2018, at Carrier Mills Nursing and Rehab Center. Robert was born on march 25, 1925 in Madison Nebraska. Robert was a World war II veteran and received the Bronze Star and Purple Heart. Robert was married to Lola M. Claus on April 4th of 1948 in Madison, Nebraska. She preceded him in death on July 27th of 2011. Robert is survived by his three sons, Daniel & Lois of Herrin, IL, James & Janice of Lincoln, NE, and David & Kathy of Council Bluffs, IA; seven grandchildren; ten great grandchildren; one great-great grandchild; brother, Dale Kollars of Fairhaven, MA, sister, Elaine Grashorn of Valley, NE; and several nieces and nephews. Funeral Services will be 7:00 p.m. Friday, July 20, 2018 at Meredith-Waddell Funeral Home in Herrin with Pastor Kerry Cox officiating. Visitation will be from 5:00 p.m. until 7:00 p.m. on Friday at the funeral home. Interment with full military honors will be 12:45 p.m. Thursday, July 26, 2018 in Santa Fe National Cemetery in Santa Fe, New Mexico. Honorary pallbearers are Christopher Kollars, Michael Kollars, Nicholas Kollars, Jason, Kollars, Jamison Kollars and Chad Kollars. In lieu of flowers the family requests donations be made to Hands of Hope Foundation 5208 Meadowland Parkway, Marion, IL 62959 or to Love Goes c/o Southern Illinois Worship Center, 124 Lou Ann Lane, Herrin, IL 62948 in memory of Robert L. Kollars. To send flowers or a remembrance gift to the family of Robert L Kollars, please visit our Tribute Store. "Email Address" would like to share the life celebration of Robert L Kollars. Click on the "link" to go to share a favorite memory or leave a condolence message for the family.